For centuries water has been associated with purifying, cleansing and healing the body both inside and out. Saunas and steam rooms can now be easily added into any private client project, to provide a place not only of peace and relaxation but as a healing space to help with the stresses of day to day life. A sauna or steam room can be the perfect indulgence in any hi end master en suite, family second floor area or wellness basement, both offer a peaceful retreat with the range of styles and finishes available making a statement focal point to enhance any bathroom or walk in wet room . Saunas are a bath of hot air where the heat can reach temperatures of up to 100℃ but because of the low humidity of 20-30%, this heat turns into a relaxing embrace where you can unwind. The clean lines and bold colours of this sauna creates a modern twist on an ancient concept bringing it in line with today’s styles . If you are not a person who enjoys heat then a steam room is an excellent place to help rid your body of toxins and promote healing. A steam room can reach 100% humidity with the temperature not exceeding 46℃ making it a much more comfortable temperature and the steam inhaled can help decongest your breathing and force toxins out of your body. The elegant simplicity of a steam room condenser and control panel can enhance any luxury apartment or residence, doubling up as a separate shower facility as well as a steam relaxation area with seating, providing a healing getaway inspired by the practices of the past. At Concept Virtual Design, we work with top designers to bring you timeless finishes and styles for luxury developments, refurbishment projects or private client new builds, to ensure your project is completed to the highest standard. Our in-house design team are available for consultations by appointment and are often brought in at the start of the architectural design process or building process to ensure that the correct bathroom space is created and that it is optimised from day one to produce the most luxurious space possible. To find out more about how our in-house design team can help enhance your project, please contact us and arrange to visit our specialist bathroom and tiles studio. Timeless in appeal. Soothing and sensuous, the ages old appeal of a hammam eases and alleviates the stress and strain of the modern world. Traditional, yet it is bought right up to date by the stylish presentation of the this exclusive, and authentic hammam. Exclusive….because it is high quality and suitable for any luxury new development or refurbishment of distinction. Authentic….because it is a genuine experience promoting health and well being, which is difficult to emulate in a comparable high class product. The hammam is the perfect place to relax in a haven of perfect serenity. Additionally you can enjoy the benefits of colour and aroma therapy in the complete privacy of your own home. Sophisticated and easy to use touch panel controls regulate the generation of steam and temperature enabling you to create an atmosphere of modern comfort, whilst enjoying the magic of an enduring ritual of cleansing and well being. A spring and bowl, reminiscent of the Turkish bath, deliver steam to the cubicle, whilst the control panel also regulates the shower head and flexible hose. Many years of experience have produced a high quality steam generator that conforms to international quality standards, which is housed in an integral column. Choose from four different marble claddings to make an individual experience of relaxation which is so necessary for modern day living. Not only aesthetically pleasing, but also low in maintenance and energy saving, the hammam is a practical and elegant solution to modern needs. Balancing modern design and technology with tradition, the hammam can be tailor made to offer an innovative, soothing remedy, bringing health to mind and body to any person with taste and looking for a sanctuary in the space and privacy of their own home. 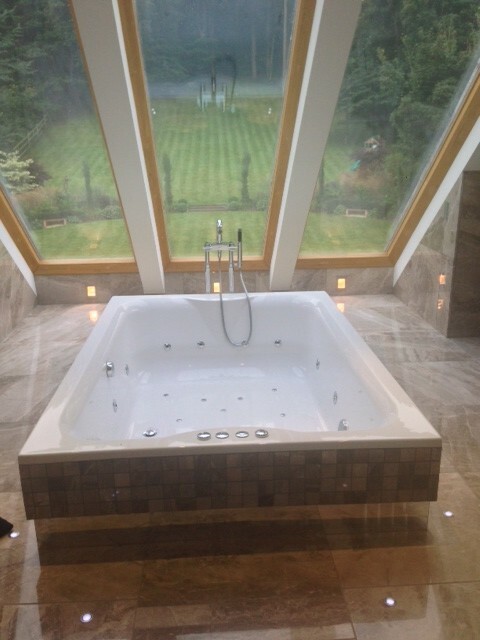 Steam and Sauna rooms are a great way of incorporating luxury, relaxation and wellbeing all into your bathroom. Not only do they add a touch of splendour and tranquility, they also offer a whole array of amazing beneficial aspects, both from a health and beauty perspective. Steam and Sauna wellness has grown significantly over the past few years, mainly due to the brilliant benefits that come with them. The heat and humidity within these features are an extremely effective way of removing toxins from your body. This is highly beneficial in many ways; Both Sauna and Steam rooms are great for raising your core temperature, opening up the pores on your skin and basically flushing out toxins more efficiently. Not only does the heat from Sauna and Steam rooms remove the toxins from your skin, but they also help remove them from your system all together, helping to boost your immune system altogether. The heat also allows opening of the veins throughout your body, thus helping your body maintain a more steady blood flow. Detoxifying not only applies to your skin, but also acts as a weight loss factor, and helps to remove fatty layers from the top layer of your skin. 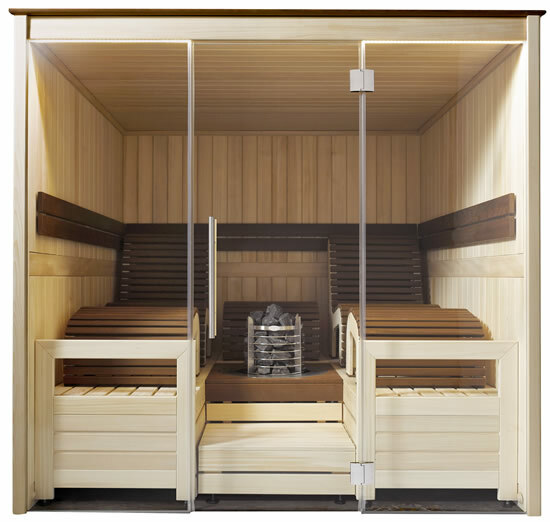 Relaxation, comfort and tranquility are just a few of the main features of both Sauna and Steam wellbeing, especially as we’re constantly hearing reports of how people are becoming more and more increasingly stressed from their day to day lifestyles. The heat from both of these features relieves stress and are a superb way of soothing tense muscles either after a stressful day, or an intense workout. Whether at the end of the day you just want some time to yourself or even just chose to unwind with a friend, both Steam and Sauna rooms can offer you the privacy you desire, or allow for great socialising opportunities with friends. Your bathroom should be your place of sanctuary, and both Steam and Sauna rooms are a dynamic way of ensuring that you get the relaxation, comfort and luxury you deserve. In May 2013, Concept Virtual Design received a 10 out of 10 score from the KBBReview mystery shopper – the very first perfect score she had ever given to a showroom. The reviewer praised the Concept Virtual Design bathroom showroom in Maidenhead and called it “a winning combination” of “friendly service” and a “classy” atmosphere. “The showroom manager […] couldn’t have been more helpful or friendly,” the Mystery Shopper said. Read the full review here. At Concept Virtual Design we pride ourselves on excellent service, beautiful design and a bespoke approach to each of our clients’ needs. 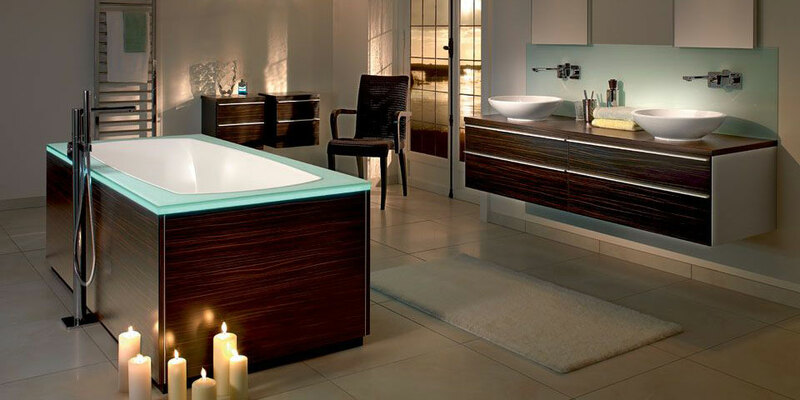 We take care of our customers, offering high quality bathroom fixtures and fittings, tiles and furniture to make their vision come true. Working with private clients, architects and luxury developers, the Concept Virtual Design team creates stunning bathrooms, shower rooms, wet rooms and spas to suit every individual brief. With our A3 colour design service we ensure that your build or renovation goes smoothly and quickly with each trade working seamlessly together, using our detailed plans and designs. Visit our Maidenhead showroom to see examples of the top standard bathroom brands we use and speak to one of our design team. There are several types of tiling to choose from, and an almost endless array of sizes, shapes and colours. The tiles you select will depend on the style of your interior design, your colour scheme, your space and your bathroom fixtures (if you have already decided on them – you may find that you fall in love with a tiling scheme first and the fittings follow). The way you use your tiles can affect the light and sense of space in your bathroom, for example: using reflective tile surfaces helps to bounce light around the room, while long horizontal tiles help to make walls appear wider. Ceramic Tiles: Ceramic tiles are composed of clay, water and minerals, and are made by baking in a kiln. 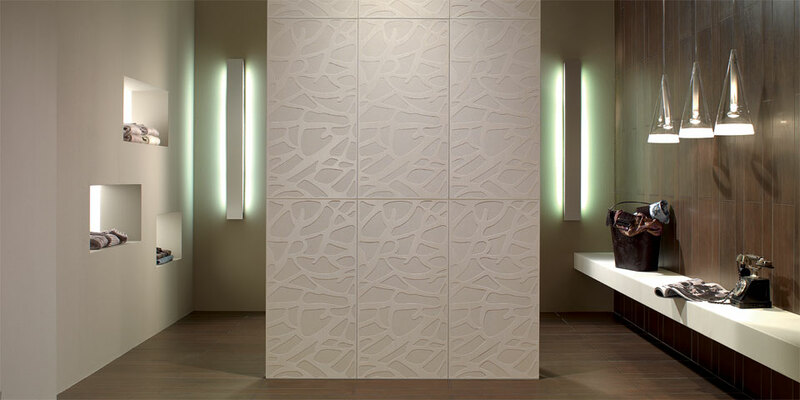 This type of tile comes in an enormous range of styles and colours, but can be fragile and porous if unglazed. The right kind of glaze not only affects the final finish and look of the tile, but provides a certain amount of absorption prevention and strengthens the tile against breaking or chipping. Ceramic tiles can range in price, but are usually a cheaper choice over other tiling options. Porcelain Tiles: Porcelain tiles are longer-lasting and more hard-wearing than ceramic tiles as they are denser. The colouring of a porcelain tile goes all the way through rather than simply being painted onto the surface, so the tones tend to be fuller and richer. This is a benefit if you do end up chipping a tile, as it won’t be as noticeable as it would on a ceramic tile. Of course, all these aspects make porcelain tiles a little more expensive, but in terms of quality and longevity, the price is usually worth it. 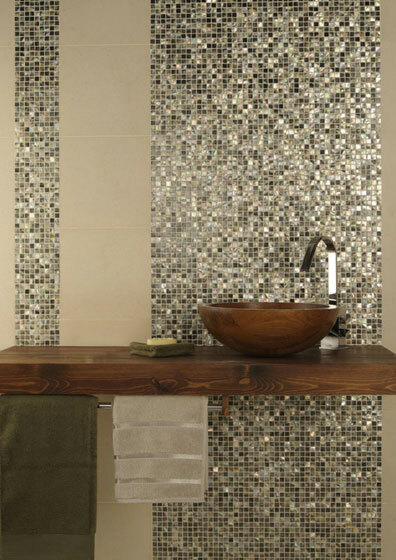 Mosaic Tiles: Mosaic tiles allow you to create an intricate effect or pattern in a range of colours and styles. Although squares are the most common variety, it is also possible to find mosaic tiles in other shape, including octogons, hexagons, rectangles and triangles. Some mosaic tiles come pre-mounted onto a mesh for ease of application, but this can limits configuration options when you’re using several different coloured tiles. Mosaics provide a striking feature in any bathroom, though it’s best to use them minimally if you have chosen a bright or bold colour, reserving them for a bath backsplash or shower area. Marble Tiles: Marble is a traditional and versatile stone that works beautifully for luxury bathroom tiling. Its natural composition means that each tile will have its own variations and unique imperfections which helps to create a one-of-a-kind look. Marble is available in several different tones, and is suitable for other surfaces as well as tiling, for example: a worktop for a basin cabinet or a window seat. Natural Stone Tiles: Aside from marble, there are a variety of other natural stone tiling options, including granite, slate, travertine, onyx and sandstone. All of these have their own unique appearances and colours, from stunning purple slate to creamy travertine. Granite is a fantastic choice for both bathrooms and kitchens (and is most commonly used for luxury kitchen worktops). Granite bathroom tiles are naturally antibacterial and are not damaged by water, making them perfect for heavy use in a wet room, for example. Sandstone has a grainy surface and feels warmer to the touch than many other tiles, making it ideal for bathroom flooring to give an inviting rustic appeal. At Concept Virtual Design, every aspect of your luxury bathroom is expertly put together using our comprehensive virtual interior design service. Let us help you find the tiling that is perfect for your project and enjoy your bathroom in total luxury. If you live in Henley or the surrounding area and are considering a bathroom refurbishment, new build or luxury development, you might want to consider a wet room from Concept Virtual Design’s expert design team. 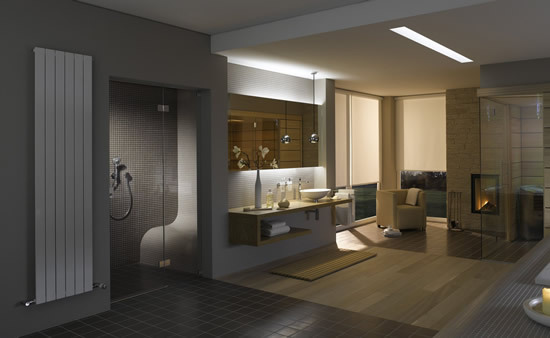 Wet rooms are a great option for private homes, hotels, spas and developments of all sizes. These luxury shower rooms can be adapted to many different styles and work perfectly in rooms where space is limited as well as open plan areas such as communal spa bathrooms. Wet rooms have many benefits over traditional shower cubicles and standard bathroom layouts as they are fully ‘tanked’, meaning that the entire space is waterproof and can be arranged to create a luxurious and indulgent bathing area. You can even incorporate basins, toilets, seating and storage into a wet room design to maximise its usability in your home or development. 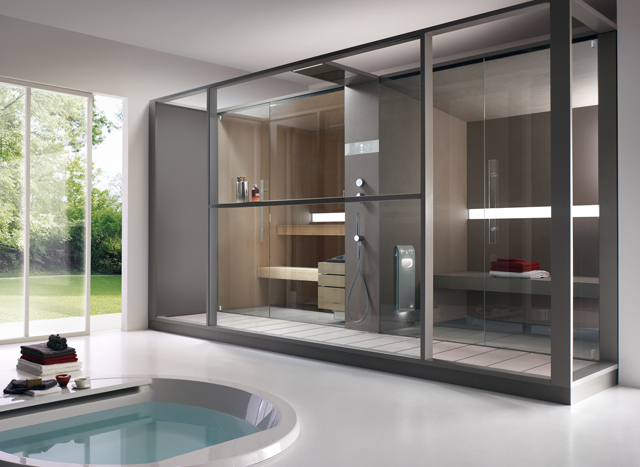 perfect for small and large rooms, wet rooms are space saving and efficient! minimalist design with maximum impact! 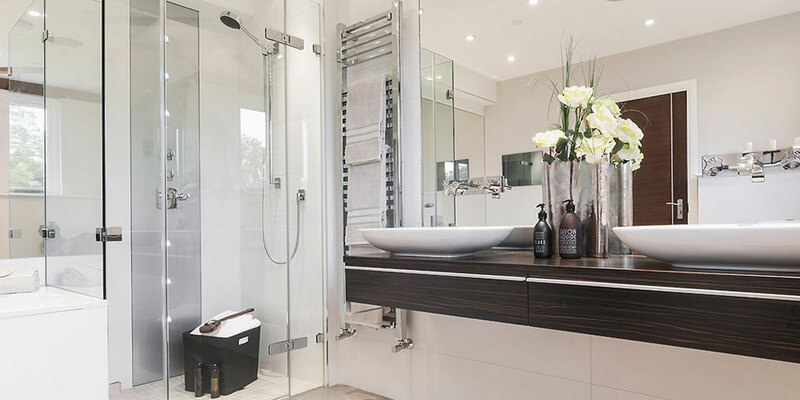 For help designing your perfect luxury wet room or shower room get in touch with us at Concept Virtual Design in Henley, Buckinghamshire, and across Berkshire and Surrey. We’re excited to offer these fantastic one-click showers as part of our exclusive bathroom and wet room interior design service. Power & Soul showers deliver a range of spray options which provide total relaxation and maximum vitalisation. Choose from a variety of different shower sprays for a real home-spa experience in your bathroom, including four single sprays or seven unique spray mixes – one to suit your every mood. The Bokoma Spray, for example, gives you a truly tension-relieving shower with its massaging spray effect. And there are three other spray patterns along with the Bokoma Spray: Jet, Rain, and Rain O2, so you can adapt your shower according to your needs – relaxing, massaging, invigorating, or simply a powerful shower to wake you up in the morning! GROHE’s Power & Soul shower range is ideal for private spas as well as home use, and are available to customers in Maidenhead and Bray looking to design their perfect shower room, bathroom or wet room. At Concept Virtual Design we work closely with our clients to create innovative bespoke interior design to suits each individual brief. We collaborate with luxury home developers, refurbishment specialists, architects, private home owners, and luxury businesses like spas and hotels, combining high quality products and fixtures with unique designs. The new range of Power & Soul shower systems from GROHE can be easily fitted to bathroom walls, shower cubicles and wet rooms and make a striking impact as well as being flexible and functional. The swivel arm of the Power & Soul shower works well in conventional enclosed showers as well as in open-plan wet rooms or over a bath. The combination of hand and overhead showers means that you can have the best of both worlds, while thermostat options allow you to set the perfect water temperature every time. There are two design choices with the GROHE Power & Soul range: Cosmopolitan and Contemporary, providing a range of aesthetics that will fit with any bathroom or shower design. Click here to download the Power & Soul brochure, or get in touch with us at Concept Virtual Design to talk over your bathroom design ideas. We provide expert interior design services in Maidenhead and Bray, and across Buckinghamshire, Surrey and Berkshire. ‘Industrial chic’ might sound like a bit of an oxymoron but natural stone and exposed brickwork is a popular trend in modern interior design, working especially well in master bathrooms, en-suites, shower rooms and wet rooms. 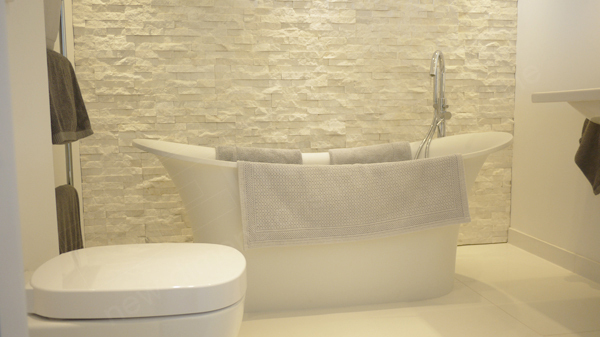 Concept Virtual Design’s bathroom and shower design service covers the Cookham area as well as the rest of Buckinghamshire, Surrey and Berkshire, offering an amazing new type of natural stone bathroom wall feature to give your bathing space a unique look. Natural stacked stone feature walls look beautiful behind baths or in shower rooms, providing texture, architectural interest and a classic style to your bathroom. White quartz is a wonderful material for stone feature walls as it has an elegant appearance which reflects light to create a faceted diamond effect – ideal for making your bathroom appear bright and spacious. 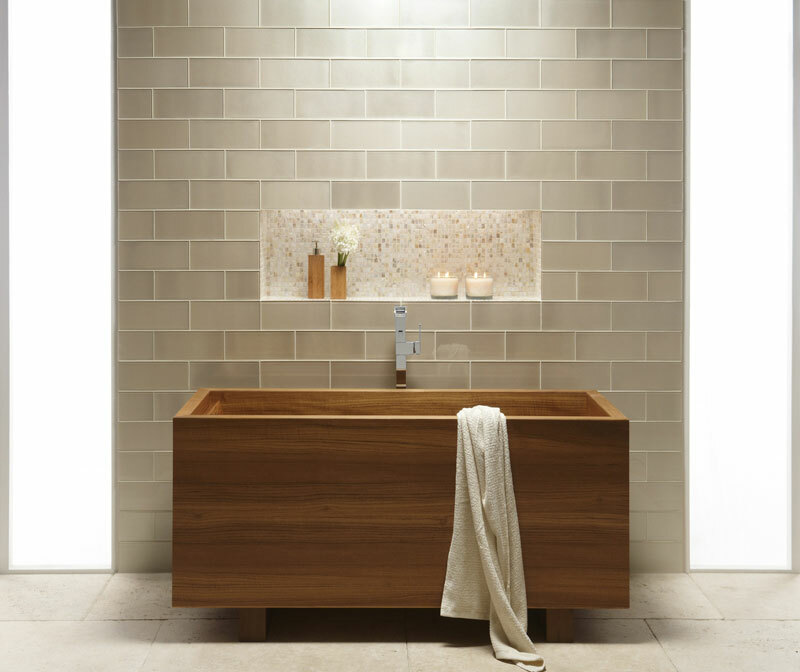 The uneven surface also brings texture to a feature wall, providing a tactile and multi-layered surface which works wonderfully against both traditional and modern styles of baths and basins. Our natural stacked stone feature wall suppliers also offer some great designs for other rooms in your home, including classic fireplaces, bedroom feature walls, and even exterior fascias and cladding. 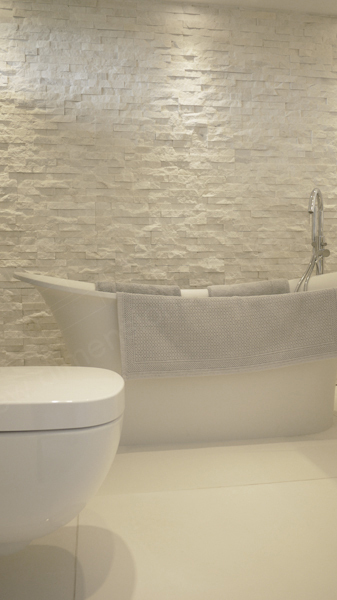 The white quartz design of natural stacked stone panels shown above and below is extremely versatile and works well on large surface areas in domestic and commercial properties. It’s easy to visualise the light-reflective surface behind a roll top bath or as part of a dividing wall in an open plan shower room or spa bathroom. 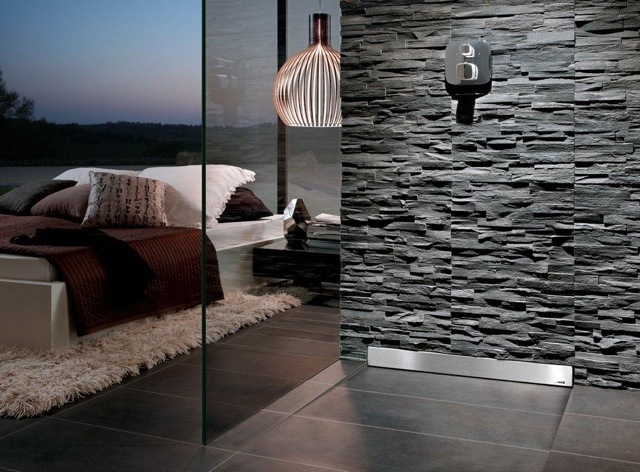 As well as natural stone wall features, we also supply many varieties of tiling in natural stone and other stylish and durable materials to complete your bathroom design, along with high quality fittings and fixtures from luxury manufacturers like GROHE. Our interior design and setting out services are available in the Cookham area and beyond. For help with the bespoke interior design of your bathroom, bedroom or study, get in touch with us at www.conceptvirtualdesign.com and we will work with your vision to create a unique look for your home or development. At Concept Virtual Design we are experts in luxury shower room design, offering bespoke interior design and setting out services to customers in Beaconsfield and the surrounding area. We believe a shower room or wet room shouldn’t just be a functional space – luxury design means creating a bathing space that is a joy to be in, incorporating high quality fixtures, mood lighting, tactile materials and stunning design elements to provide you with a refreshing and relaxing showering experience. 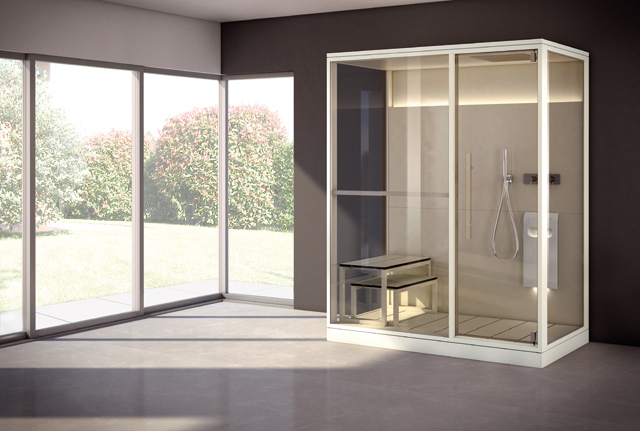 Shower rooms and wet rooms are the ideal addition to any home, providing a valuable showering area that can be constructed in any area of your house – as an en-suite, adjacent to an existing master bathroom, in attic spaces or lower floors. 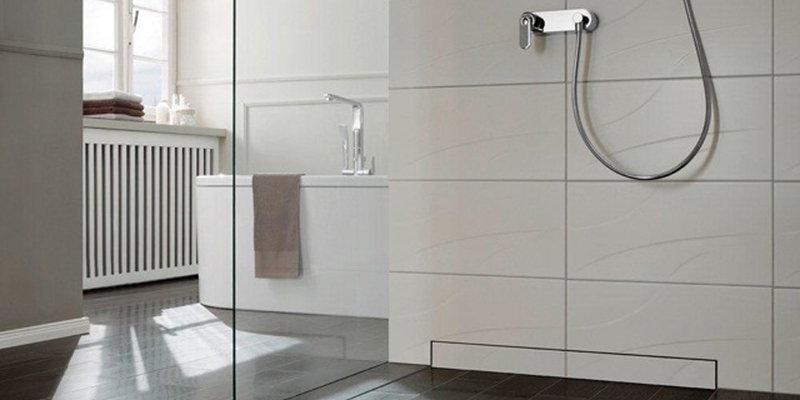 Wet rooms and shower rooms can add value to your home as well as offering a luxurious bathing space, especially when fitted with massage jets or high-end shower fixtures like the Grohe Spa F-digital Delux controller. 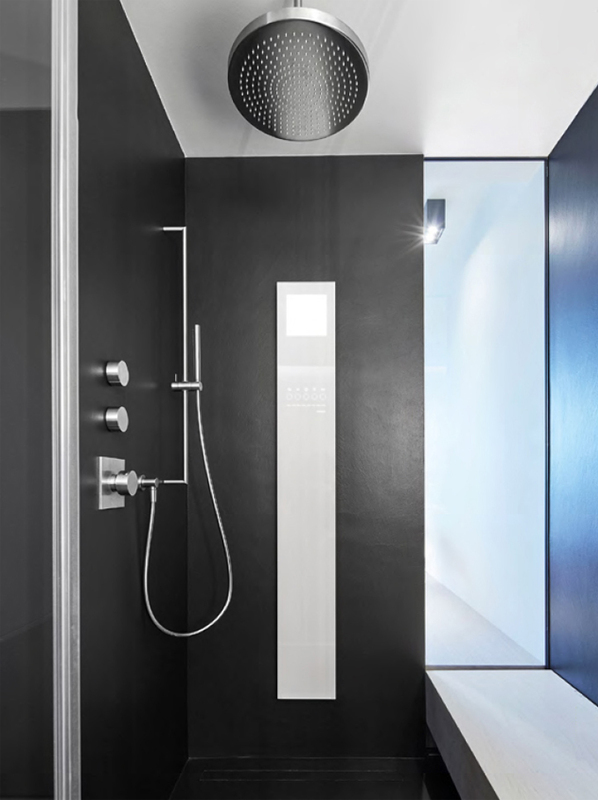 The F-digital Deluxe ambient controller allows you to adjust and customise your shower to stimulate the senses, including controls for lighting, sound and steam. Using audio-therapy, chromo-therapy and steam-therapy, GROHE’s new digital shower control transforms your daily bathing routine into an invigorating and detoxifying experience. ‘Steer’ light, sound and steam within your shower area to listen to your favourite tunes, dim and change the colour of your lighting, and add steam for extra relaxation and purification. The GROHE Spa F-Digital Delux controller can be combined with GROHE’s Allure faucet range and Grohtherm F metal architectural water controls to suit your individual design aesthetic. At Concept Virtual Design, we don’t just deal with luxury bathrooms and shower rooms. Our bespoke design, supply and setting out service can be used throughout your refurbishment or development, from bedrooms to en suites, studies to dressing rooms. You can see examples of our exclusive interior design options at our Maidenhead showroom, which was described by Kitchens, Bedrooms & Bathrooms Magazine as “enticing” and received a perfect score in their mystery shopper review this year. Visit our Maidenhead showroom to see a little more of what Concept Virtual Design can offer your development or refurbishment. KKB Magazine recently gave us a 10 out of 10 review for our beautiful bathrooms, shower rooms,wet rooms, and exclusive interior design. Our detailed design and setting out service provides easy organisation and visualisation for clients, contractors and tradesmen. With every aspect of design in place right from the earliest planning stages, including position of plumbing, pipework, electrics, lighting and tiling, unnecessary mistakes are avoided and schedules run as smoothly as possible. 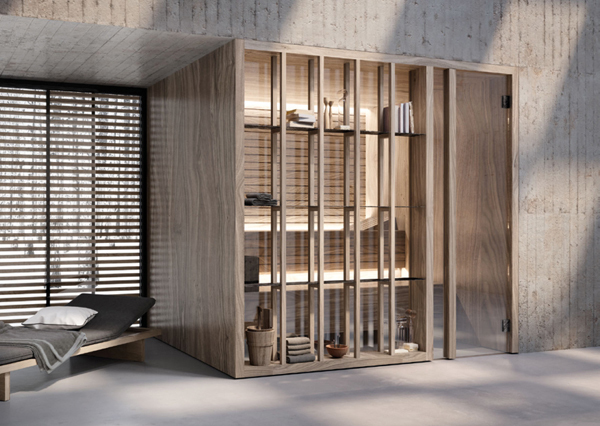 Built-in bespoke wardrobes, beautiful bedrooms, custom studies and luxury bathrooms all work together to create your perfect interior design throughout your build or refurbishment, seamlessly designed and planned by Concept Virtual Design.